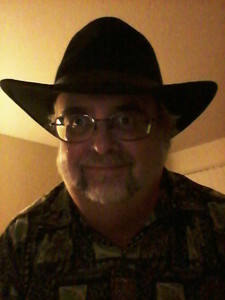 Fantasy and steampunk novelist, all-around wisecracker, level three steampunk, fan of webcomics and nerd music, and penguin aficionado, Robert Dahlen lives in California with quite a few penguins, a tablet stuffed with e-books and works in progress, and two very nice hats. 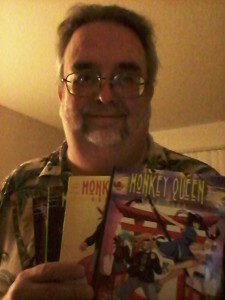 He had been trying to find the right way to tell his stories until he discovered indie publishing, bought his trusty tablet, and rediscovered an early version of the Monkey Queen synopsis on March 16, 2013. The next day, he wrote, “It was another crappy Friday for Beth McGill.” He hasn’t stopped since unless he’s rearranging his Disney Infinity and Funko Pop figures, preparing for a tea duel, or trying to convince people that Kari Zev is the best Magic: The Gathering character ever. He is hopefully working on another book as you read this, and he’s glad you stopped by. A happy author with his books. Indeed, it is a very nice hat.